The announcement of the world’s largest floating solar-farm coming online didn’t grab as many headlines as it should have. 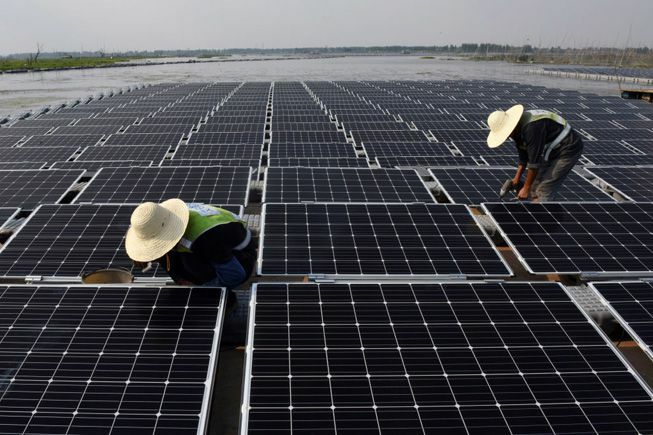 Located on a lake created by rain water flooding a former coal-mining town, this floating solar farm in the eastern part of China’s Anhui province – a coal rich region in the central part of the country – leverages the cooling aspect of the water’s surface and takes advantage of the large surface area unsuitable for nearly any other human use. As Irina Slav says in her OilPrice.com piece, also published in Business Insider, the whole situation is rather poetic – a former coal mining town is now home to a solar farm. The title of “world’s largest floating solar farm” has transferred hands a few times since 2016. In early 2016, an installation on a reservoir near Walton-on-Thames that generates 6.3 MW of power for Thames Water, a water treatment company in London, clinched the title. Later in 2016, Xinyi Solar moved to the top spot with their 20 MW farm in Huainan City. Sungrow Power Supply’s record-breaking farm is also in the city of Huainan, and is expected to generate 40 MW of power, enough to power ~15K homes in China. These 160,000 panels have enabled Sungrow to clinch the title of “world’s largest float solar farm”, for now. Japan is looking to bring a floating solar farm online in early 2018. While it is unlikely to grab the title from the current holder, Japan’s 13.7 MW facility is illustrative of the innovative planning essential to large scale solar implementation going forward. South China Morning Post writer Sharah Zheng highlights another interesting project that is leveraging “unusable” space for power generation with reports of Chinese State-owned National Complete Engineering Corporation working with solar giant GCL to install a 1-gigawatt solar plant in the exclusion zone of Chernobyl. In early 2017, China announced an investment of US$361 billion in expanding the countries renewable power capacity over the next 3 years. Last year (2016), China installed 35 GW of solar, rocketing China to the top of the installed solar list. China’s commitment to renewable energy is evident and with the recent announcement of the US exiting the Paris Accord combined with the proposed budget cuts to US energy research, China is situated to become the global climate and renewable energy leader. China is poised to reap significant benefits from their investment in green energy, as Tom Phillips points out in a Guardian piece from early 2017. From the economic opportunity of exporting low-carbon technology to the environmental benefit of shifting away from coal, China is ensuring its prominent position in the “clean energy market” of the future by investing in technology development and deployment today.